Was at the Hong Kong Airport last week on the way back to Singapore. It was a 2pm departure and it means spending my lunch time inside the airport. Instead of the usual Burger King or Popeye's Fried Chicken cravings, we decided to go somewhere a little quieter since we have Gabriel along. The menu in there was quite interesting and this particular dish caught my eye. I like Peking Duck and I like Pizza. Quite a no brainer that I should just point my finger at the menu to the approving nod of the waiter. The pie arrived shortly as I sank my eagerly awaiting teeth. Verdict? Well, the duck skin wasn't as crispy but I kinda expected it for after all this is an ang moh restaurant. I mean how good can their Peking Duck be, right? The meat however was very good. Juicy and disintegrates at first bite. The only downer was perhaps the plum sauce that they lathered all over the pizza pie that it ended up more sweet than savoury. Personally, for me I like my pies savoury. Hence Hawaiians are not exactly my first choice. Speaking of pizza, I notice the difference between pizzas here and in the US. Over here, we have every single damn thing on the top while the American counter parts are the simple straight forward pepperoni and cheese. Ironically, the latter being the simpler, gets my vote on the yum yum count. Okay this dish looks interesting leh. Hear you describe I also want to eat. I had my dinner at 6+ and now is half-past 10. Feeling damn hungry now. I think I won't mind trying duck pizzas at all. You know quite a while ago there was this aloe vera craze? Seems like it's a must that everything must have aloe vera in them. Then much earlier they had the green tea craze. I'm so glad they never taint the good old pizzas that I like. Zhebin: Not a big fan of Aloe Vera (the plant, not the blogger) myself. The only Aloe Vera I used is the sun repair gel after getting sunburnt. I had to transit at HK airport last month didn't see this Peking Duck pizza thingy. Ended up eating at this Taiwanese Beef noodles place that sells Hong Konger food ...duh. I find the new Hong Kong Airport a bore, and they don't sell the good brand "lao po bing" (Hong Kong puffs), only the touristy lousy ones. 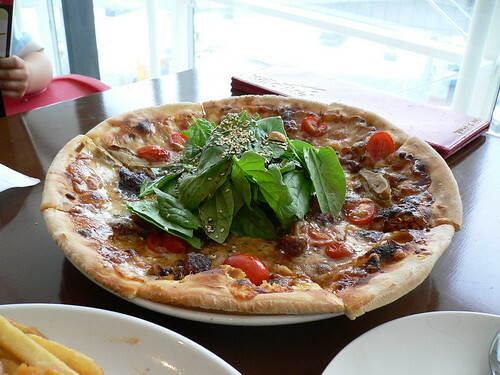 I think this peking duck pizza can be found in Singapore too; i read it somewhere on the newspaper before. personally i prefer duck over chicken. wonder if there's fried duck selling somewhere in the world...btw, is there cheese in/on the duck pizza? sirennights: The pizza is located (air-side) at this restaurant called Wildfire. It is located opposite the row of food stalls (where they have Ajisen, Burger King and Popeye's). okie dokie: Yes, there is cheese on the duck pizza. As weird as it may sound, it tasted pretty ok, surprisingly.